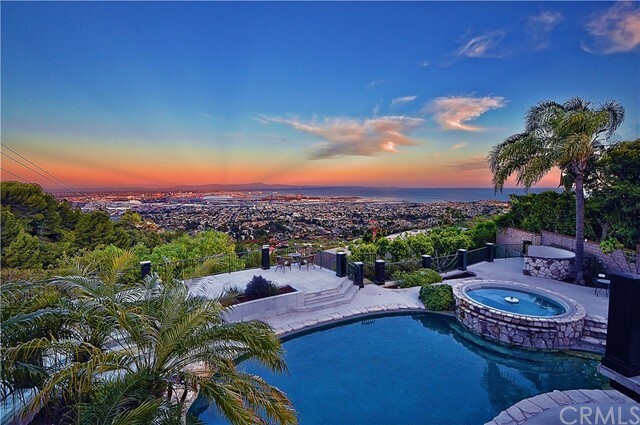 Come home to one of Rancho Palos Verdes' finest streets, where homes capture some of the most spellbound views from dawn well past the setting sun! This luxurious home offers the most epic views from almost every room we have ever witnessed! From the famous Port of Los Angeles to Newport Beach, and from the rising sun to city lights – there are views 24 hours a day. Situated on a large private lot, with a sparkling pool and spa easily makes the backyard a paradise perfect for entertaining large or small groups or just enjoying a cup of coffee on one of the many patios. The flexible floorplan with 7800+ square feet has 7 bedrooms, an office with built ins and wet bar, living room and dining room with a wall of windows, kitchen and great room combination, movie/media room, gym, downstairs den, 3 wood-burning fireplaces. © 2019. The multiple listing data appearing on this website, or contained in reports produced therefrom, is owned and copyrighted by Multi-Regional Multiple Listing Service, Inc. ("MRMLS") and is protected by all applicable copyright laws. Information provided is for viewer's personal, non-commercial use and may not be used for any purpose other than to identify prospective properties the viewer may be interested in purchasing. All listing data, including but not limited to square footage and lot size is believed to be accurate, but the listing Agent, listing Broker and MRMLS and its affiliates do not warrant or guarantee such accuracy. The viewer should independently verify the listed data prior to making any decisions based on such information by personal inspection and/or contacting a real estate professional. Listing courtesy of Steven Watts from RE/MAX Estate Properties . Last updated Thursday, April 18th, 2019.